Dulce Et Decorum was a poem written by Wilfred Owen when he was in hospital. It is a poem that is most commonly known because of the bitter truth that Owen writes with. 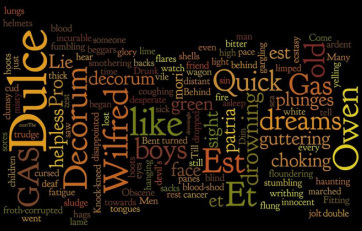 Owen writes "Dulce Et Decorum Est" with many poetic techniques such as similes, metaphors, personification, rhyming, alliteration, hyperbole, onomatopoeia, direct speech and irony. Irony is a key factor that shapes Owen's poem Dulce Et Decorum. Dulce Et Decorum Est is Latin for "It is Sweet and" which is then completed in the last lines of the poem to be "dulce et decorum est pro patria mori" which translates to "it is sweet and glorious to die for one's country". The irony shines through this because throughout the whole poem Owen is talking about how men are "like old beggars" and "In all my dreams, before my helpless sight, he plunges at me, guttering, choking, drowning." Owen then further portray the irony in war by stating "the old lie:" just before he writes "dulce et decorum est pro patria mori" The whole irony that is portrayed in this poem is brought on by the British army campaigning that "We want you". Watch this short film of hand painted pictures that plays out "Dulce Et Decorum Est".